Archaeologists tell us that we have been shaping gems for over 100,000 years. Those early examples of lapidary art are shells and bits of bone, which are soft and can be drilled and strung into necklaces fairly easily. Later, people learned to polishgems like agate and jade into different shapes using still-harder stones to grind them down, but the knowledge that harder stones could cut softer ones was nearly useless when it came to diamonds, because of all the rocks and metals that we find on earth, diamonds are by far the hardest. In practical terms, this means that only diamonds can cut other diamonds, and even then, diamonds are exceedingly difficult to cut. Even so, by the late 1300scutters in Venice, Italy, were starting to develop techniques for shaping and polishing this most mysterious of gems, and by 1450, they had introduced the basic cutting style that would become our 58-facet modern round cut. The first faceted diamonds were point cuts, which look as if someone had taken a rough diamond crystal and given its eight sides a thorough polish, maybe even adding a few facets to the corners. Point cuts don’t really look like diamonds; the ones adorning 15th century kings and queens are usually square and dark. For diamonds to take on the “white” look we’re familiar with, a big change had to be made: the pointed top of the stone had to be ground flat, creating the facet we call the table and letting light escape from the confines of the crystal. These stones were called table cuts, and by the late 1400s they had taken the jewelry world by storm. Their outline was still squarish, but their tables and a few additional facets gave them a brilliance that captivated the increasingly well-dressed Europeans. Jewelers even cut tables into their clients’ old point cut gems, which could then be reset into fashionable new jewels.Further changes came about after the discovery, in 1720, of diamond mines in northern Brazil – cutters introduced a fiery new diamond called the baroque cut, which brought an unforeseen brilliance to the diamond-heavy brooches, earrings and necklaces popular with the aristocracy at the time. The baroque cut kept the table cut’s familiar shape but added facets to both the top and the bottom. This faceting pattern introduced the eight-square symmetry we see in modern diamonds: an octagonal top facet surrounded by eight triangular and eight diamond-shaped facets; triangular facets top and bottom ring the widest point of the gem, and below those, eight more diamond-shaped mains and an octagonal culet complete the diamond’s pavilion. As the 1800’s wore on, the baroque cut had its lower girdle facets lengthened, a change that ushered in the old mine cut and finally, toward the later part of the century, the old European cut. As specifiedby master cutter Henry Morse, old European cut diamonds are round, highly symmetrical stones with steep-angled sides and small tables, whichcreate a rich and fiery brilliance. 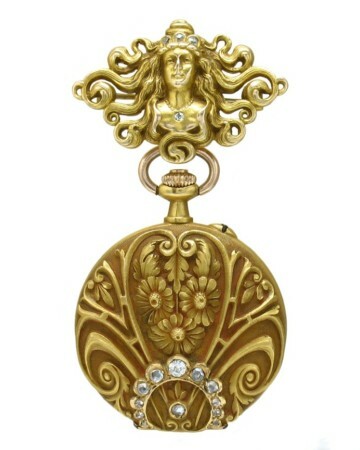 Gems with these proportions are common in the jewelry of the time and retain their popularity to this day. Early 20th century cutters began to experiment more: Frank Wade, in 1916, illustrated a “well made diamond” with a small table and a tiny facet at the stone’s tip; Marcel Tolkowsky, whose 1919 book Diamond Design is seen as the start of modern diamond cutting, recommendedboth facets be larger. Increasing the table size balances the light differently, and as the 20th century went on, cutters flattened the angles on their stones even further, creating the look we associate with modern-cut diamonds. By the ‘50s, most diamonds in jewelry were cut to what was called the American Ideal. This diamond, much shallower than the old European cut, had a table approaching 60% of the stone’s width, slightly shallower crown and pavilion angles than Tolkowsky had specified and relatively short lower girdle facets. 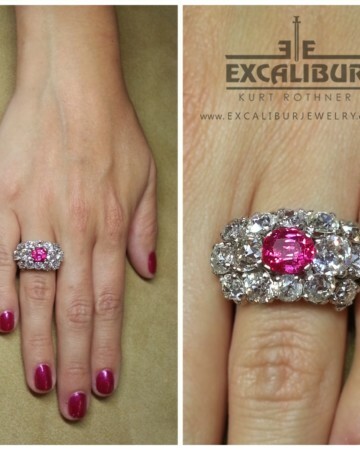 Later on, this too would change, and perhaps the best way to differentiate mid-century diamonds from those cut in the early 21st century is to look at the pavilion mains: their narrow blade-like profile is a function of exceedingly long lower girdle facets, giving the stone its hard-edgedreflection pattern. Because diamonds are both rare and precious, jewelers throughout history have sought to find ways of setting them that made use of even tiny, odd-shaped bits of rough crystal. Working with hard-to-cut flat shapes called macles and later with the slices that sometimes resulted from cleaving, medieval cutters developed the rose and double rose cuts. 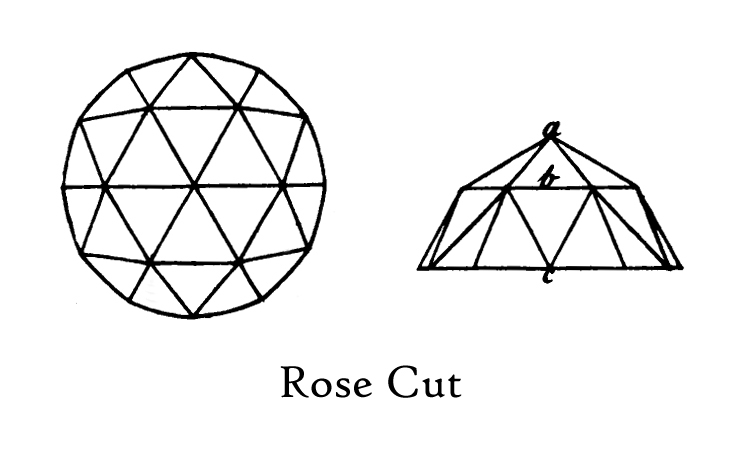 The rose cut is most commonly seen as a rounded half-dome, with facets cut onto the surface. Some observers have compared them to geodesic domes. Double roses are similar to chandelier drops, and are popular for colored stones as well these days; rose cuts, which were in jewelry as early as the 1300s, can occasionally be seen in Victorian jewels but were largely eclipsed by the more vibrant table and baroque cuts in the 1600s. 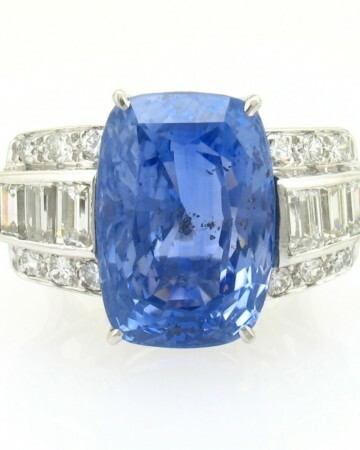 Other variations started to be seen as early as the 1400s: first the square cut, which gave rise to French cuts and ultimately princess cuts; then the cushion cut, in which the square or rectangular symmetry of an old mine cut is emphasized. The clean geometry of the Asscher cut, in 1902, foreshadowed the elegant lines of the Art Deco era’s beloved baguette and emerald cuts. The Asscher cut was introduced in 1902 by Joseph Asscher, head of the firm that faceted the 3106 ct. Cullinan for the British royal family. The Asscher was the first diamond cut to have been branded and patented, and the cut itself was recently redesigned and re-introduced. 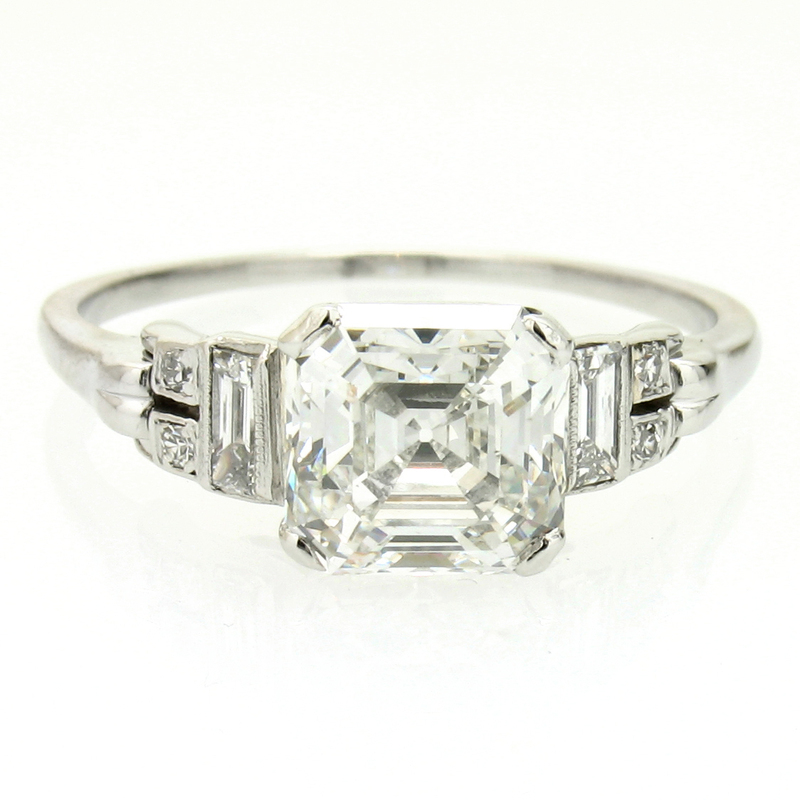 The classic Asscher cut is nearly octagonal in shape, like a square emerald cut but with bolder corners. It has three steps leading up to the table from the girdle and a seven-stepped pavilion, which gives it more sparkle and fire than the traditional emerald cut. 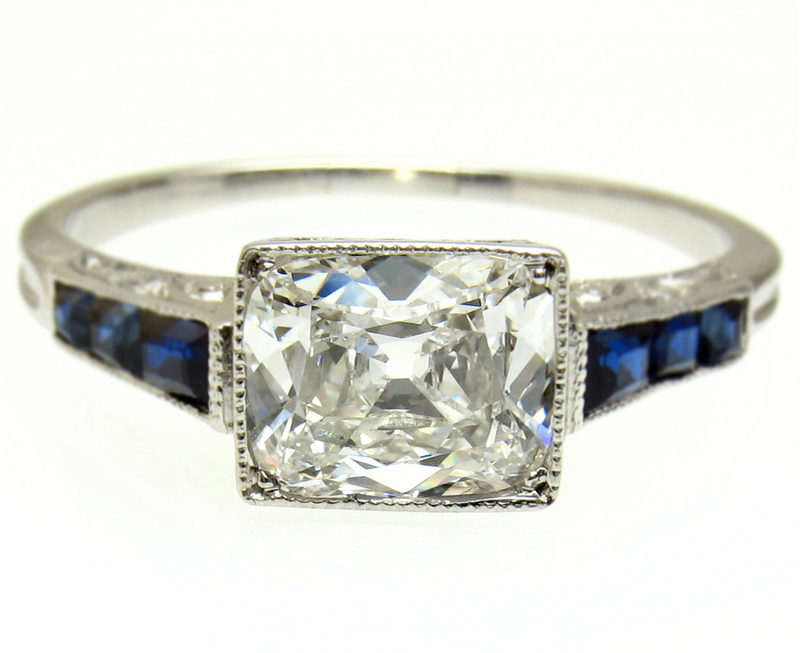 The modern version, called a Royal Asscher, adds an additional row of facets on the base of the stone. 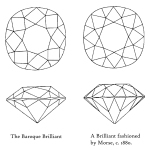 The French cut probably evolved as cutters sought to make efficient use of the rounded diamond crystals known as “dodecahedrons.” French cut diamonds are square or rectangular, with sharp corners. They feature a diamond-shaped table surrounded by eight triangular facets, and their pavilions are simply cut into a pyramid form. 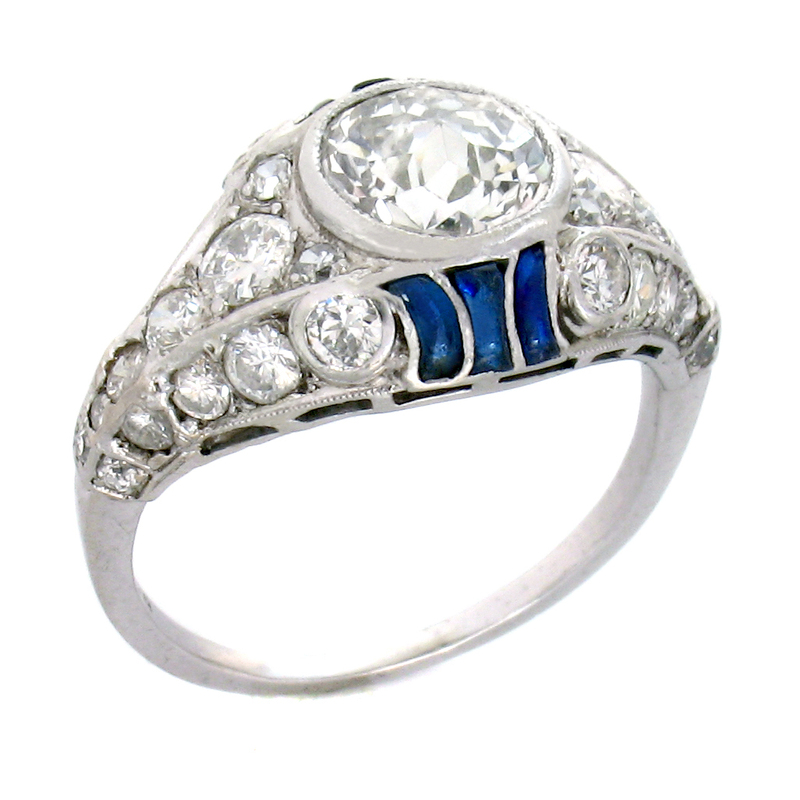 French cuts are commonly seen as accent stones and are somewhat more vibrant than the baguettes more typically seen in 20thcentury settings. The Jubilee cut was invented in the United States in the early 20th century and named in honor of Queen Victoria’s 1897 Golden Jubilee. It is unique for having a point in place of the customary flat table on top, and because its crown and pavilion facets don’t mirror each other the way most round diamonds do, it has a charming and slightly eccentric brilliance. The cushion (or antique cushion) developed in parallel with the old European cut. 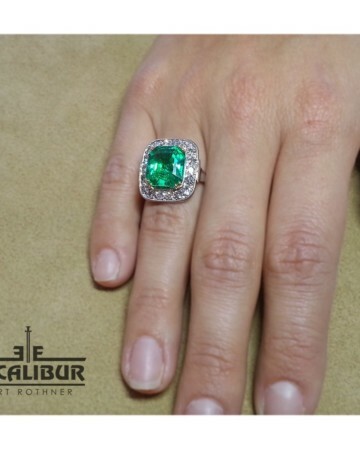 As it became possible to craft a diamond that was more perfectly round, jewelers and designers found that there was still a demand for square or rectangular stones that carried the same fire and brilliancy people had loved in the old baroque cuts. 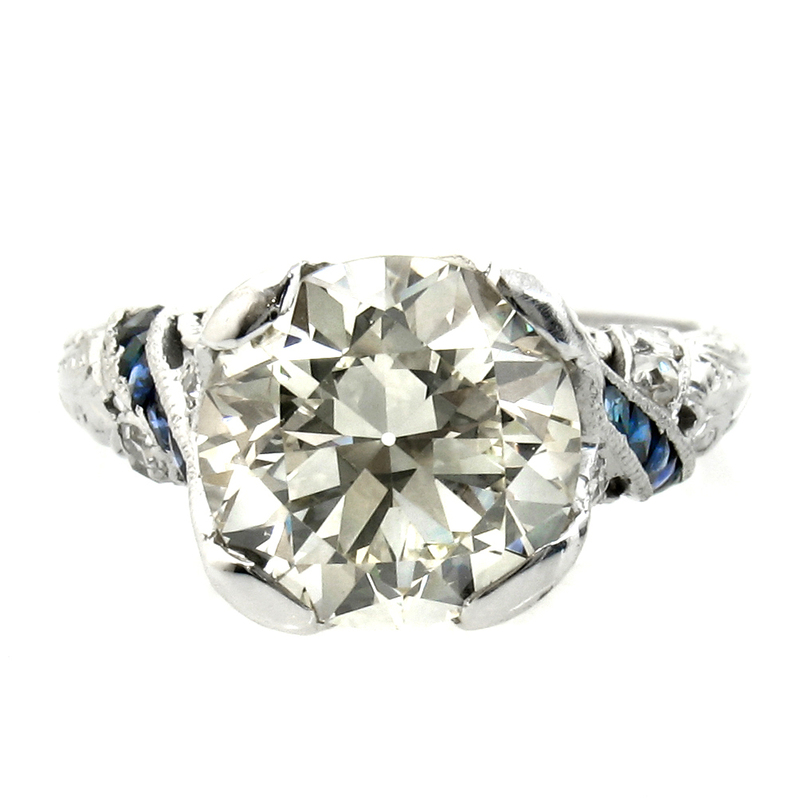 The cushion cut was the ideal solution: its graceful outline echoed the antique shapes, yet its symmetry and sparkle meant that it could stand up to the most meticulously-crafted “modern” jewels of the Edwardian era. Nowadays, of course, we’re used to seeing diamonds in crisply-defined shapes: rounds, ovals, and princess cuts, among others, accented by tiny, perfectly-matched side stones. That perfection is made possible by machines that shape the rough diamond crystals. Prior to machines, though, this work was all done by hand, carefully and painstakingly, and so while it’s easy for modern eyes to spot tiny variations in antique gems, their irregularities weren’t for lack of standards, and careful examination of many old diamonds in museums has shown that these standards were largely adhered to by diamond cutters and jewelers anxious to be known for their commitment to quality. 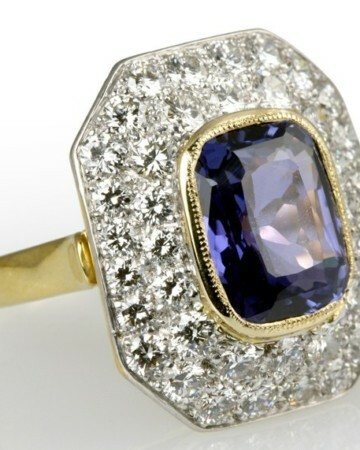 Our modern emphasis on cut as part of a diamond’s value dates back to at least the mid-1700s. 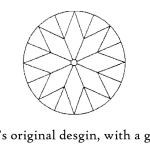 In his 1751 treatise on diamond value, David Jeffries criticizes cutters whose obsession with ever-larger diamonds results in “lifeless” gems, yet there has to be a balance between size and perfection, and grinding away too much of the precious crystal on the wheel was a good way to find oneself out of a job. 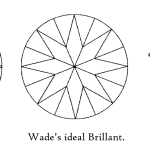 Anticipating the work of later writers, Jeffries specified proportions that would produce a stone that was better than the average run of diamonds, just as today’s emphasis on “ideal” cutting gives us diamonds that are bright and symmetrical. Yet it’s important to keep in mind that research on the behavior of light within diamonds tells us that there is no one “perfect” set of proportions. Rather, it’s the interplay of angles and the relative shapes of all the stone’s facets that combine to create the look of each individual diamond. And so, while modern labs do set grades for cut, careful examination of what goes into those grades shows a range of values in each category – and ultimately, labs can’t quantify personal preference. For some people, the warmth and fire of an old European cut diamond or the bright white light reflecting back from a mid-century brilliant is far more beautiful than that of even the best modern “ideal” cut gem. Harlow, George E. (ed) The Nature of Diamonds, 1998. Cambridge University, UK, and the American Museum of Natural History, New York. Jeffries, David. A Treatise on Diamonds and Pearls, 1751, London. Wade, Frank B. A Study of the Factors That Govern Their Value, 1916.Putnam; New York. 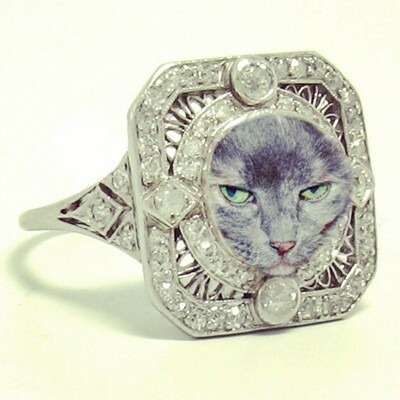 PreviousWhy a Vintage Engagement Ring?